The process is to send to post the text on the forum and we will then contact you for further publishing. Vous pouvez vous inspirer de ce que nous avons deja fait. We can also make you appear among the frogsonline editorial team contacts. 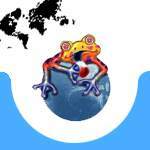 You can animate the forum of your country or town and answer questions. I hope that you will find this activity useful and funny and we are waiting for your contact very soon. Martin Guillaume, for the frogsonline team.